The DFG is actively committed to equal opportunity and the equality of women and men in the German research system. The promotion of “equality between men and women in the scientific and academic communities” has been anchored in Section 1 of the DFG’s statutes since 2002. 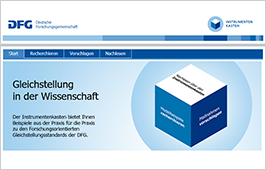 The aims of the DFG’s equal opportunity work – to achieve a gender balance in the research system and to make a scientific career compatible with family commitments – promote equal opportunity and excellence in the research system. These aims also make Germany more attractive as a place to research, particularly for highly qualified early career researchers. What does diversity mean in research funding?